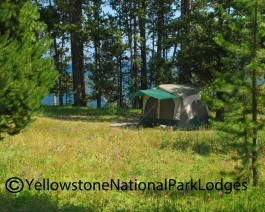 Bridge Bay Campground was named for its proximity to Bridge Bay Marina on Yellowstone Lake. The campground offers open sites with few trees, or shadier options in the wooded upper loops of the campground. There are over 400 regular sites and 4 group sites available, 16 public restrooms with flush toilets and faucets with cold running water. Dishwashing stations are located at the rest room buildings. Pay showers and coin laundry facilities are located 3 miles away at Fishing Bridge RV Park. All campsites have a picnic table and fire grate and water is accessible nearby. RVs up to 40 ft. long may be accomodated in pull-through and back-in sites.